The day is quiet and the sea still; there is not a breath of breeze to turn against. The oblique sunlight breaks through the layers of high grey cloud from time to time and casts a soft shadow. The waders stand quiet in their ranks. The regiments of godwit, avocet, lapwing, redshank, golden plover and dunlin are all present along with a smattering of ducks preening and idling like camp followers, but the mere is not teeming as before. A dark marsh harrier meanders low over the wide fields to wreak havoc but rolls round at the last minute as it nears the small road where birdwatchers are stationed. 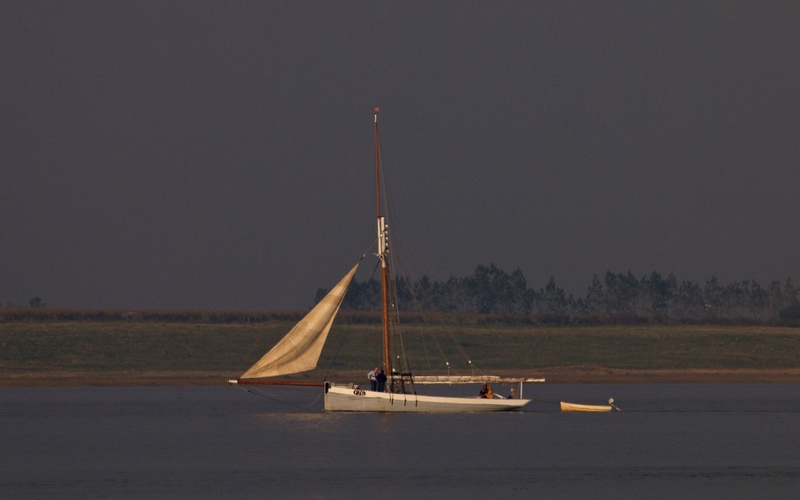 An old boat runs up the Swale on her jib and a rattling diesel. 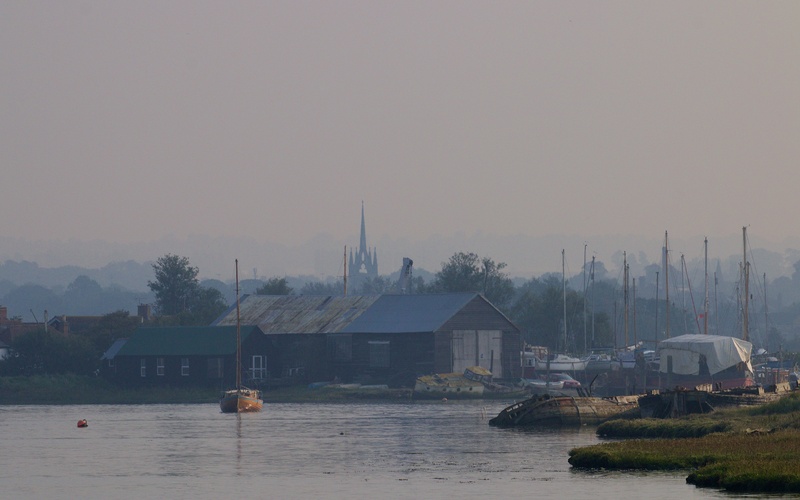 The view of Faversham church distant beyond the Oare boatyards. The glasswort (Salicornia sp.) 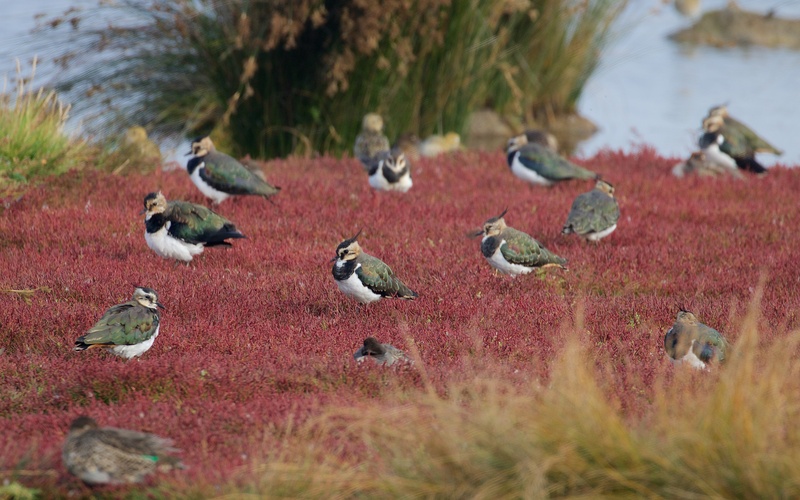 is in full bloom and provides a red carpet for the roosting lapwings. These are a hard group of saltmarsh species to identify and this could be either common (S. europaea) or purple glasswort (S. ramossisima). The Kent Botanical Recording Group identified both and many others besides when they visited in October 2011. 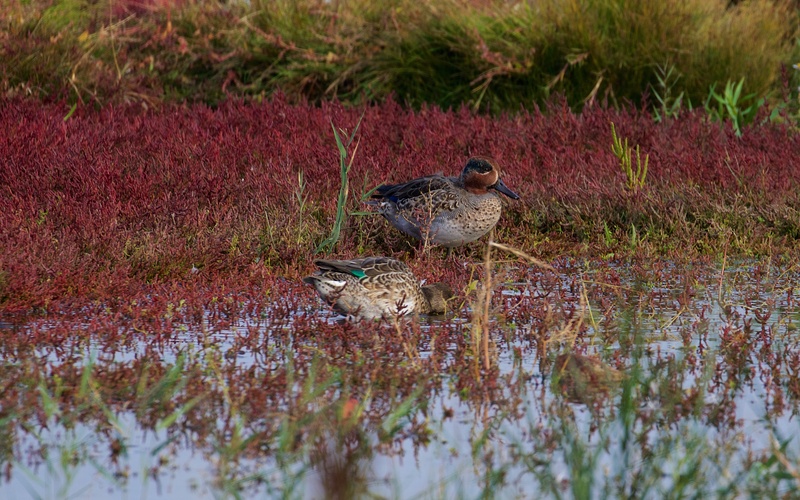 A pair of teal; the male with the handsome red head with broad green splash through the eye. The vivid green speculum is visible on the female. The enormous shovel of a bill on a female shoveler is used to preen wing feathers with surprising delicacy. 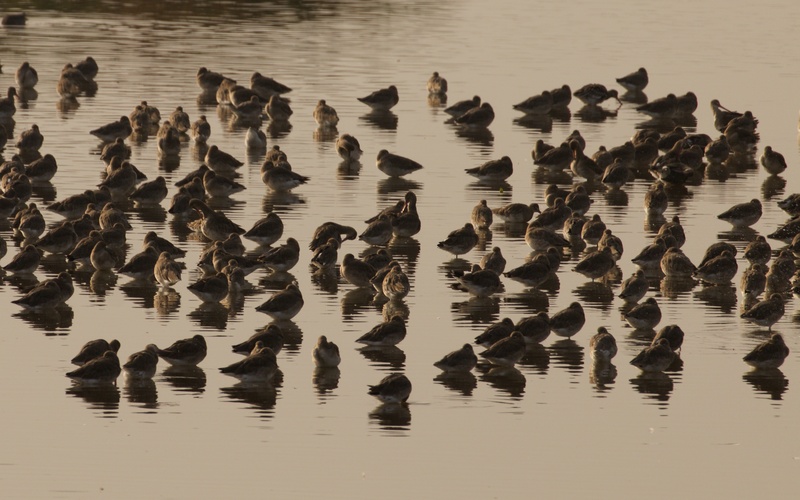 Roosting black-tailed godwits backlit in the afternoon sun. 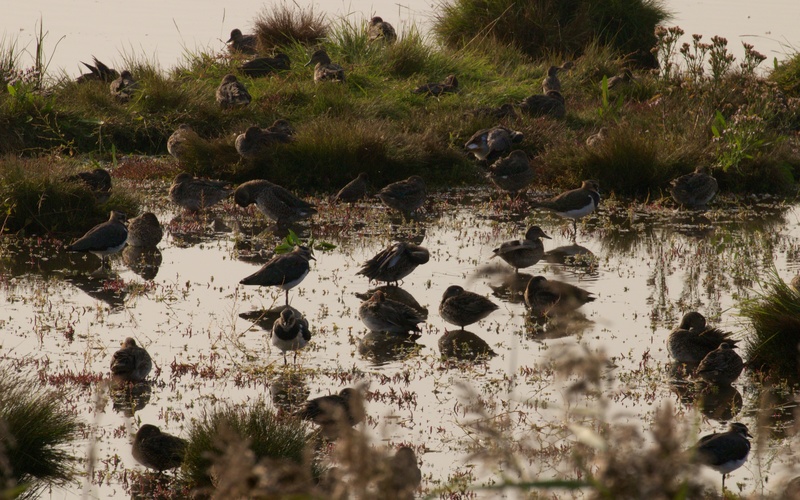 A mixed group of lapwings and teal. Konik ponies, originally from Poland and related to the Eurasian wild horse or tarpan (Equus ferus ferus), are a stocky and muscular breed with dun and chestnut coats . 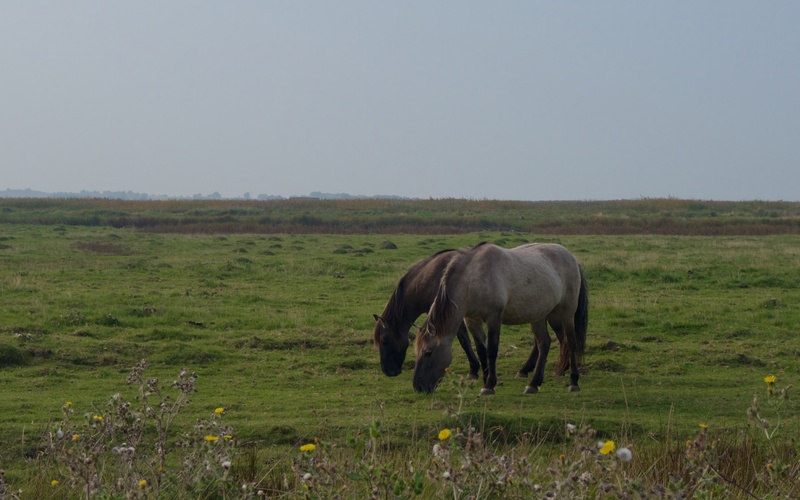 The Koniks are at home on the soft ground and manage habitats better than machines; they have been widely introduced to wetland nature reserves, such as Oare and Wicken Fen in Cambridgeshire. They have also been introduced into much larger areas in mainland Europe to assist the ‘rewilding’, or perhaps the rewinding of landscapes, especially abandoned agricultural land and coastal wetlands. Like many of the best advances in ecology, Americans came up with rewilding as a conservation approach; first David Foreman, an ecological activist, defined the idea in 1990 and Michael Soulé and Reed Noss, two conservation biologists, then refined the strategy. One of the triggers for rewilding in Europe was the equally original work of Frans Vera, who in 2000 suggested that prior to human forest clearance and agriculture over the past 7,000 years, lowland Europe was not dominated by closed-canopy forest but rather a mosaic of woodland, scrub and wood pasture (something akin to old parkland such as at Windsor Great Park or Knole). Vera postulated that this was created by the grazing pressure exerted by large herbivores including wild ox or auroch (Bos taurus primigenius), Eurasian wild horse or tarpan, Eurasian elk (Alces alces), wild deer and, most impressive of all, Eurasian bison or wisent (Bison bonasus). Bison are still found in the ancient Białowieża Forest in northeastern Poland but auroch and tarpan are both now extinct. The ‘wood pasture’, as opposed to the ‘closed-canopy’, hypothesis is still disputed, but the idea energised conservationists both to think ‘big’ and also let ‘wild’ animal populations control the development of ‘wild’ habitats. In effect, stand back and see what happens. Rewilding is thus achieved by the introduction of native, or near-native, herbivore populations that are managed with only minimal intervention and thus allowed to self-regulate their populations. The Vera model has been tested on 5000 ha. of Dutch polder, the Oostvaardersplassen; the grazing pressure exerted by Konik ponies, Heck cattle, and native deer species is permitting ecological processes to once again shape the flat landscape. 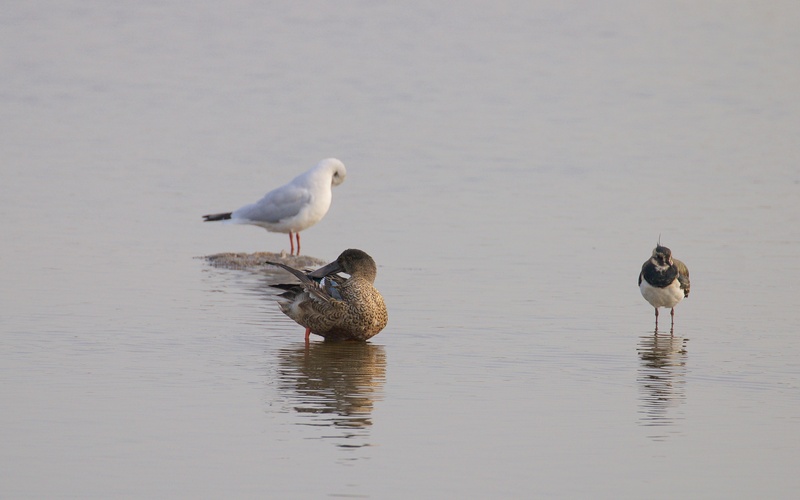 Huge populations of waterbirds are now found there; wildlife watchers flock there too. But the wetland is small and mammal mortality especially in harsh winters has been high; sad images of starving animals created a public outcry. The weakest animals are now culled in the autumn to attempt to reduce the suffering and mimic the impacts of carnivores. The reserve is expanding into neighbouring areas to provide improved refuge areas and wolves may one day roam the polders. Rewilded landscapes are now being planned and established in the less dense areas of Europe, particularly Iberia and Eastern Europe. A new conservation NGO, Rewilding Britain, has just been launched here with its eyes on the empty uplands. In order for natural ecological processes, including seasonal migration to operate, ‘wildscapes’ require huge swathes of forest and former agricultural land. This chimes with the work of population ecologists; they determined that the probability of local extinction for a species, especially those with specialist habitat requirements (the Glanville fritillary butterfly was one of the model species) is greatest on small, isolated sites and hence successful conservation must involve networks of large and well connected sites. Back in 1998, Soulé and Noss coined the phrase ‘cores, corridors and carnivores’ to summarise rewilding. That alliteration has pretty much defined the conservation priorities for many working in terrestrial ecosystems ever since. So imagine a contiguous landscape of wild marshes, wood pastures and reedbeds along the North Kent coast, sweeping across to Stodmarsh, the Canterbury forests and Sandwich Bay in the east and then round to Pevensey Levels and Dungeness in the south. Herds of red (Cervus elaphus) and roe deer (Capreolus capreolus), European bison, Konik ponies and Heck cattle roam free, hunted by Eurasian lynx (Lynx lynx), European brown bears (Ursus arctos arctos) and Eurasian wolves (Canis lupus lupus), and why not a pride or two of Asiatic lions (Panthera leo persica)? Roads and railways will require land bridges and acres of agricultural land abandoned to enable free movement of these large mammals across what are currently fragmented patches of habitat and so create a wild landscape. Of course, pheasant and duck shooters may bag more than they bargained for and Sunday walkers and cyclists need take a little more care on their outings. As they graze peacefully, these well-fed ponies do not look very wild at all. I loved your photographs – the red glasswort makes a glorious backdrop. The bears and lions may be a step too far! I’m not really a purist these days and your post made me think a kind rewilding might be best – providing a little help for the creatures being encouraged to get them through the toughest parts of the year. Thanks…I am not at all sure what I think about rewilding but it is interesting to talk about it. Making a bit more space for nature, especially in overcrowded corners of England is a good idea (and entirely harmless).